It was just yesterday that we shared with you guys the first poster for the ninth film by Jackie Brown and Kill Bill writer-director Quentin Tarantino. The movie is called Once Upon a Time in Hollywood and yesterday's poster featured stars Leonardo DiCaprio and Brad Pitt hanging out and looking ten types of cool in front of the famous Hollywood sign. I dug that poster quite a bit, but my one issue is that I would have liked to catch a glimpse of Margot Robbie's take on the real-life actress and Charles Manson victim Sharon Tate. While that didn't happen, today it's all good as now we have an all-new character poster for the upcoming flick which lets Margot Robbie shine all on her own outside the famed Westwood Village theater, which is showing the 1966 comedy Penelope starring Natalie Wood, as directed by Arthur Hiller. In 1969 Los Angeles, Rick Dalton (DiCaprio) is a Western TV actor struggling to transition to movies. Dalton and his longtime stunt double and best friend Cliff Booth (Pitt) embark on an odyssey to make a name for themselves in the film industry. But there's one extra element that should spice things up along the way, DiCaprio's character is also the neighbor of Margot Robbie's Sharon Tate. Oh, snap. Tate was, of course, a pregnant actress married to Rosemary's Baby and Repulsion director Roman Polanski who was murdered in her home by followers of Charles Manson. Damon Herriman plays Manson in this film and he'll be joined by Dakota Fanning as Lynette "Squeaky" Fromme, a member of the infamous "Manson family" who was not directly involved in the Tate murders, Austin Butler as Charles "Tex" Watson, a central member of the "Manson family" who, alongside three other members, was directly involved in the Tate murders, and Lena Dunham as Catherine Share, a member of the "Manson family" who was not directly involved with the Tate murders. The Tate murders cast includes Samantha Robinson as Abigail Folger and Costa Ronin as Wojciech Frykowski. Other real-life roles include Damian Lewis as Steve McQueen, Mike Moh as Bruce Lee, and Rafał Zawierucha as Roman Polanski. Al Pacino, Emile Hirsch, Tim Roth, Michael Madsen, Kurt Russell, Timothy Olyphant, and James Marsden will be joining the party as well with Bruce Dern taking over the role of George Spahn, which was originally intended for Burt Reynolds before his death last year. Filling out the killer cast is the late Luke Perry, along with Ethan Hawke and Uma Thurman's daughter Maya Hawke, and Bruce Willis and Demi Moore's daughter Rumer Willis. From there the cast includes Scoot McNairy, Clifton Collins Jr., Lew Temple, Lorenza Izzo, Dreama Walker, Zoë Bell, James Remar, Danny Strong, Clu Gulager, and a bunch of other actors and actresses I'm not familiar with. 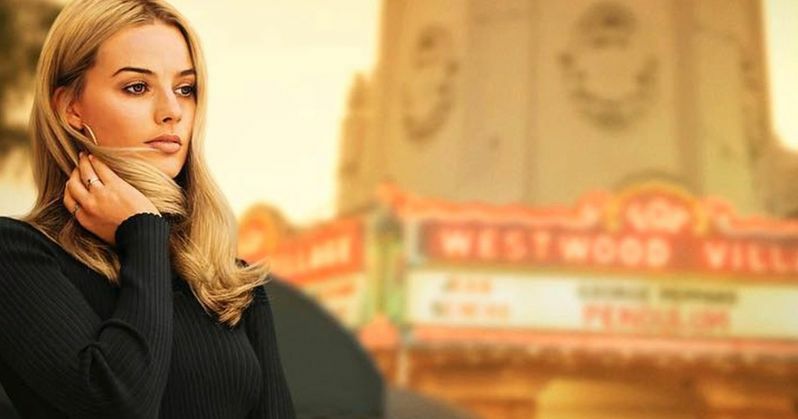 Sony Pictures Releasing unleashes Once Upon a Time in Hollywood on July 26, 2019. The poster was shared by Margot Robbie's Instagram.